If you’ve ever browsed the veggie burger section at the grocery store, you may have seen the Boca burgers and various veggie burgers there. To make things more fun for the meat eaters branching out, they now have veggie ribs, breaded chik’n patties, and more. I’ll admit that some of them taste pretty spot on. Those breaded chik’n fingers! 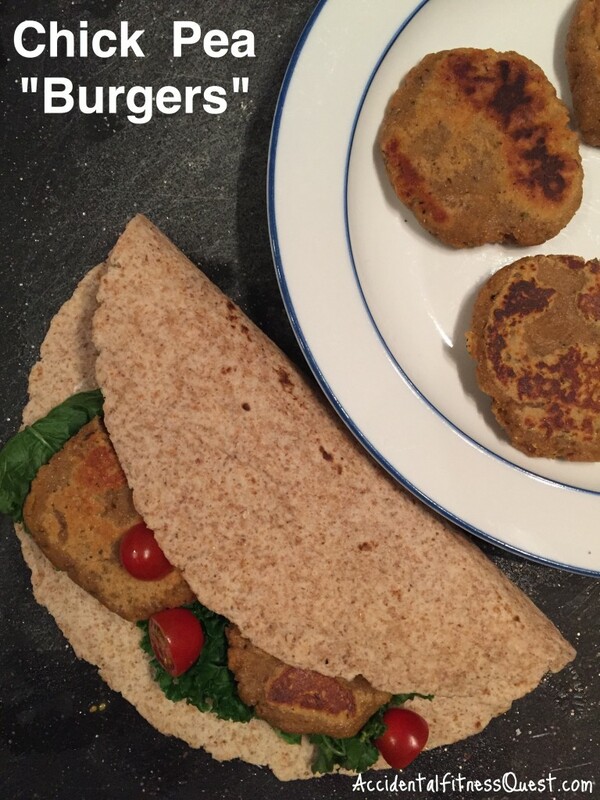 I’ve played around with making seitan on my own from wheat gluten and I use that quite a bit in vegan dishes, burgers, and wraps. This week I decided to attempt chik’n patties just for fun. It was just a matter of playing with the ingredient ratios and frying them up like burgers. No, they won’t pass for chicken burgers, but they were pretty tasty in a salad and in a wrap. Measure the chick pea flour, gluten, bread crumbs and spices into a large mixing bowl. Add the soy sauce and 1/2 cup of the water. Mix with a fork to begin to blend. If the mixture is dry and crumbly, add another 1/4 cup of water. Knead the dough with your hands for about 2-3 minutes until well blended and stretchy. Divide the dough into 8 equal sized pieces. Roll each piece into a ball and smoosh it into a burger shape with your palm. Heat a large skillet over medium heat and spray with non-stick spray. Cook the patties like you would burgers for about 6 minutes per side. Remove from heat when they are nice and browned on each side. Makes 8 patties at approximately 117 calories each – 15g protein, 12g carbs, and 1g fat. You can toss a patty on a bun, top with buffalo sauce and cheese, for a buffalo chik’n burger. Throw them in a wrap with lettuce, tomatoes and mayo. Slice them and use the strips to dip in BBQ sauce or top a salad. There are lots of ways to use them so have fun with them, and plan a Meatless Monday meal.